Mr B and Emi have been away wargaming this weekend. Whilst they've been busy commanding their Dacian troops against Trajan's Roman Legions the Wonder Dog and I have been keeping ourselves busy back at base. In truth it's beginning to feel a bit like Christmas ... . I know, I know: shoot me now for mentioning the dreaded C-word so early in November! 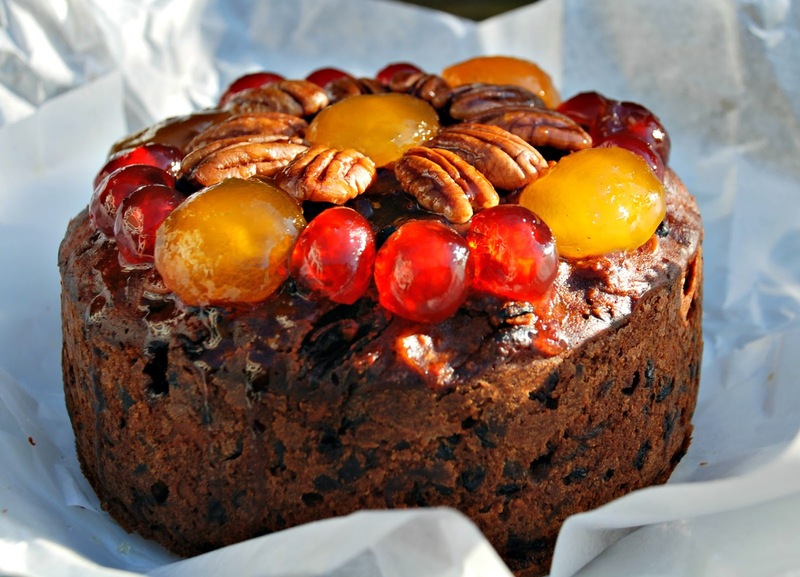 But, the thing is, if you're planning on making a Chrimbo cake you really need to get cracking now or it'll be too late to feed it the requisite amount of alcohol to achieve that perfect level of boozy, fruity unctuousness by the Big Day. Yesterday I spent the morning baking my cakes. I used my old, tried and tested recipe, which you can find here: Boozy Bejewelled Christmas Cake. The house smelt divine with that wonderful fruity, buttery, spicy smell that comes from fruit cakes baking slowly in the oven. Yum! And when the rain finally cleared, the Wonder Dog and I managed to squeeze in a walk just before darkness fell. 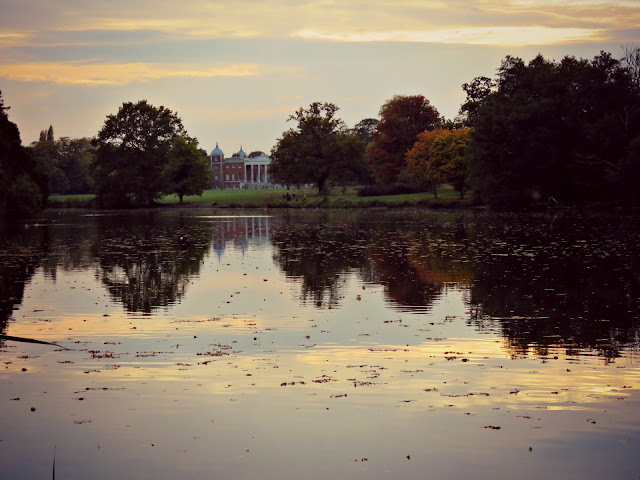 We went around the lake at Osterley Park, and as the sun fell low in the sky there was the most wonderful sense of calm. Everyone and his dog was out making the most of it. I've also been busy knitting an angel for the top of the Christmas tree. It's a new pattern which is relatively straightforward. The only problem has come with making her wings. First of all I didn't have any white card. It was raining cats and dogs, and I couldn't be bothered going to the shops to buy any. So I pulled some brown card out of the recycling and set about painting it. At first the only thing I could find to paint it with was Tipp-Ex, but 10 minutes in I was starting to get high on the fumes. Yeehaw ... that white-out liquid is potent stuff. I limped off in a Tipp-Ex-induced haze to the garden shed, and came back triumphantly with a can of Pure Brilliant White outdoor masonry paint. I painted my wings on one side, and was only slightly demoralised when the card went limp and curly in an unappealing wet-paper sort of way under the influence of whatever caustic chemical had been added to the masonry paint. I left them to dry in the conservatory, and I was so sure that I'd closed the door to keep the Wonder Dog out, but when I went back an hour or two later I discovered a trail of neat, white Schnauzer-sized paw prints that would seem to indicate that I may not have done ... drat! And to make things worse the neat Schnauzer-sized paw prints seem to have taken a turn on the leather sofa for an afternoon snooze. Ooh well, it's lucky that I've got lots of scatter cushions in there to hide the odd tell-tale print from a paw that's been dipped in masonry paint. Sooo, finally I gave in and went to the shops for a packet of white card ... .
Then I messed around with lacy stitches stretched over my white cardboard cut-outs, which really didn't produce the look I was after. 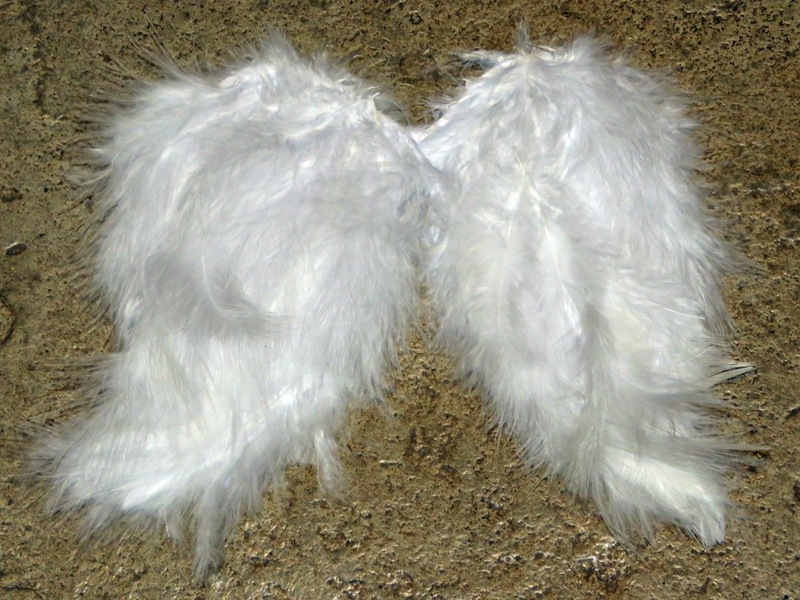 I mean whoever heard of knitted angel wings? That's just wrong. Next I went down the floristry butterfly route, but - several sparkly butterflies later - that was also a disappointment. So finally I pulled out a box of marabou feathers and got down to sticking marabou feathers on white card cut-outs. After a while I started to wonder where the marabou feathers might have come from. The name suggests they came from a tall gangly marabou stork, which I'm pretty sure doesn't get bred in captivity for its feathers. I'd also be prepared to bet that nobody had gone scaling the trees to pluck a few feathers from the mother marabou's tail when she wasn't not looking. She looks like a pretty evil-tempered bird who'd peck your eyes out sooner than part with a tail feather. A spot of googling later - and, yes, I had by this point got very bored sticking marabou feathers on card - I realised that my so-called marabou feathers probably came from a turkey! But by now I'd gotten sticky turkey-marabou feather fluff all over the keyboard of my computer. By the time Emi and Mr B came home they found a bad-tempered woman with a fluffy computer who was brandishing a pair of diminutive angel wings and trying to conceal a set of ghostly paw prints that came from nowhere and went for a snooze on the sofa. I'm sure they're wondering what they'll find when they come home again tonight ... .
Not to much of a fan of fruit cake but I must say that one does look tasty. What a lovely scene for your walk. Oh my you had a time with those wings and paint. They look pretty.